It is a reminder of the garbage collection day displayed every day. 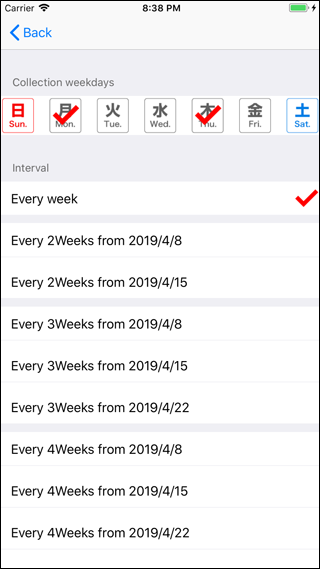 Of course, it is also possible to display the calendar unit of a month. Notes can be set for each type of garbage. (For example, “Can raw garbage be taken out as combustible waste?” Etc.) Notes can be written also on daily calendar. The notification settings for each garbage are cleared each time, and it is necessary to start the app to update the notification. 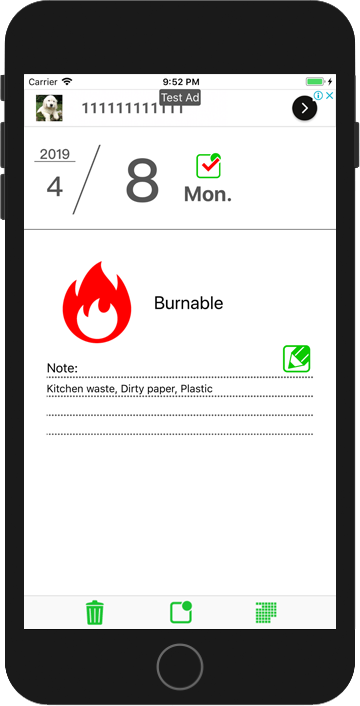 Tap the trash can icon to display the “Collection schedule” screen. Select “Add new garbage type”. Enter the “Garbage Type Name”. Be sure to enter the garbage type name. If the garbage type name is not entered, it can not be registered even if other items are set. Select an icon. You can register without selection, but nothing will be displayed on the calendar display screen. 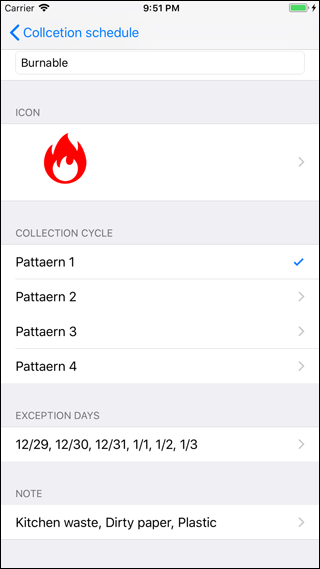 Choose collection schedule pattern from 4 types of schedule patterns and set them. 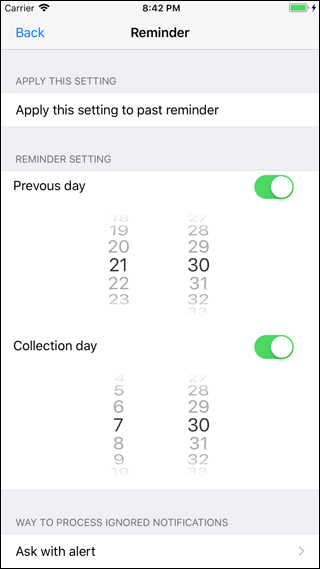 You can set the day when collection is not performed, such as year-end and New Year holidays. 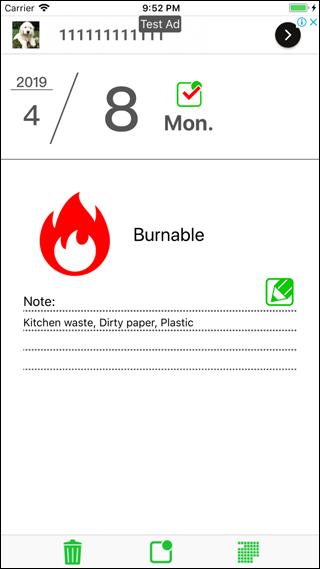 You can set a common note for each type of garbage, such as details of garbage that can be taken out and precautions. The note is displayed in the note column of the date display. Set the notification time on previous day and collection day. You can swipe left and right to move the date. 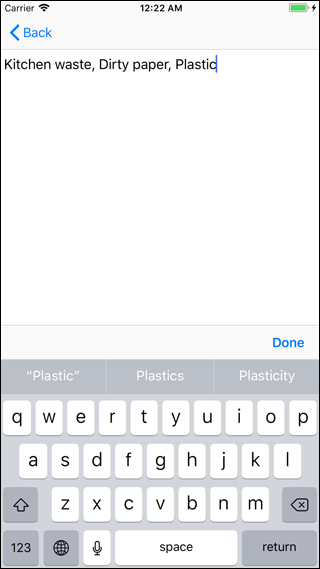 The reminder button switches the reminder ON / OFF. With the pencil button, you can enter notes that apply only to the day. Switch to calendar display with the lower right button on the initial screen. 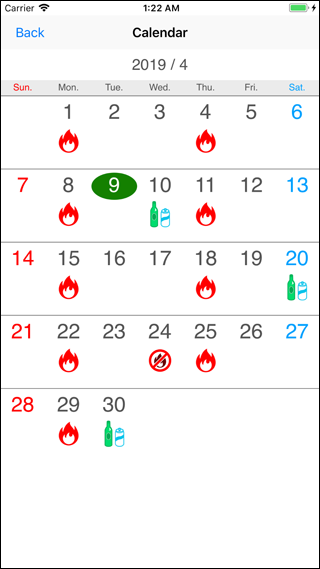 Swipe left and right to move the month. “Today” is displayed with white numbers on a green oval. Tap the date to switch to the date display of the day. This application is a free application created by Satoshi Horiguchi. In this application, we will never request, collect, sell or sell personal information such as name, address, email address, credit card number, social security number etc. to third parties. In addition, we do not acquire, use, transfer and sell to the third party, photographs, contact addresses included in the device, data in another application etc. This application does not connect to the Web. Therefore, it does not use cookie information stored in the device. Copyright © Horiguchi's site All Rights Reserved.